Peppina is a pizzeria in Bangkok serving authentic Neapolitan rustic Style pizza and is the only pizzeria in Thailand certified by the Associazione Verace Pizza Napoletana as making true Neapolitan pizza which involves using traditional ingredients, preparation methods, type of oven and even the type of wood to fire it. The end result is the best pizza in Bangkok. Peppina makes their own dough using just water, sea salt, flour, and yeast. 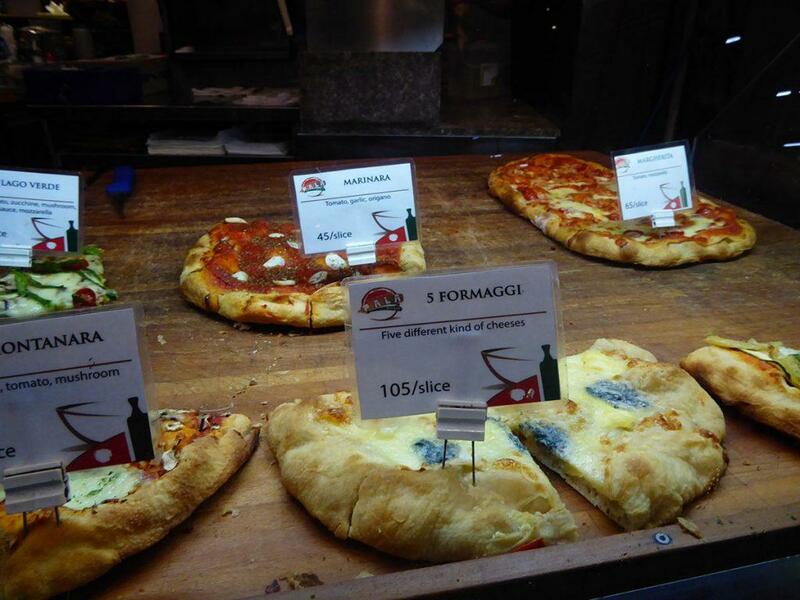 Most ingredients are imported from Italy as is the oven. 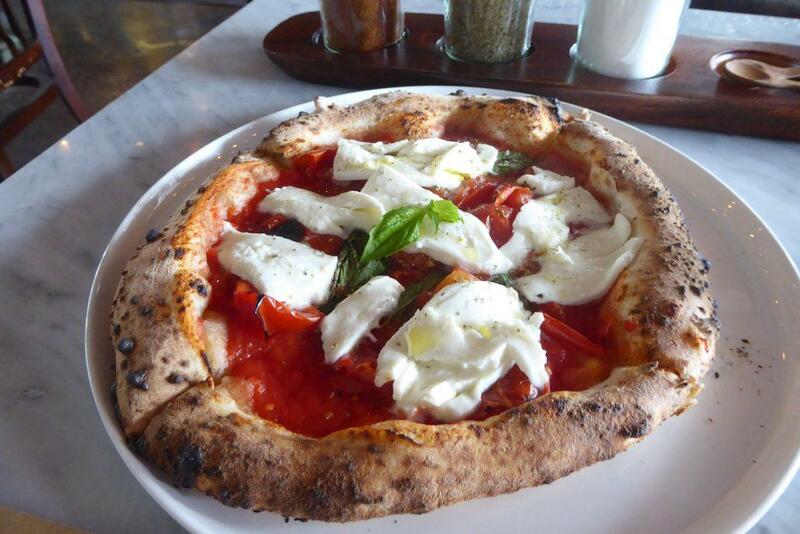 The pizza is cooked quickly at high heat leaving a soft base and a crisp crust. 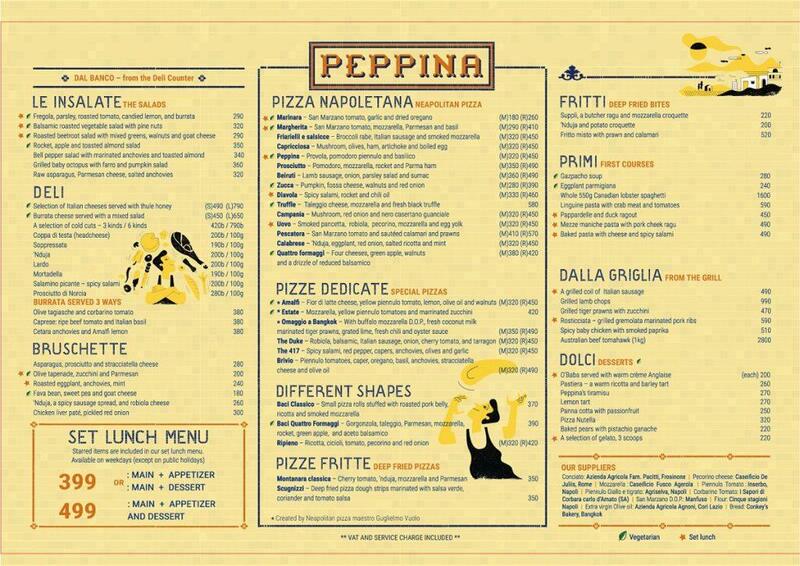 Peppina offers a choice of 13 pizzas which are delivered to your table uncut. 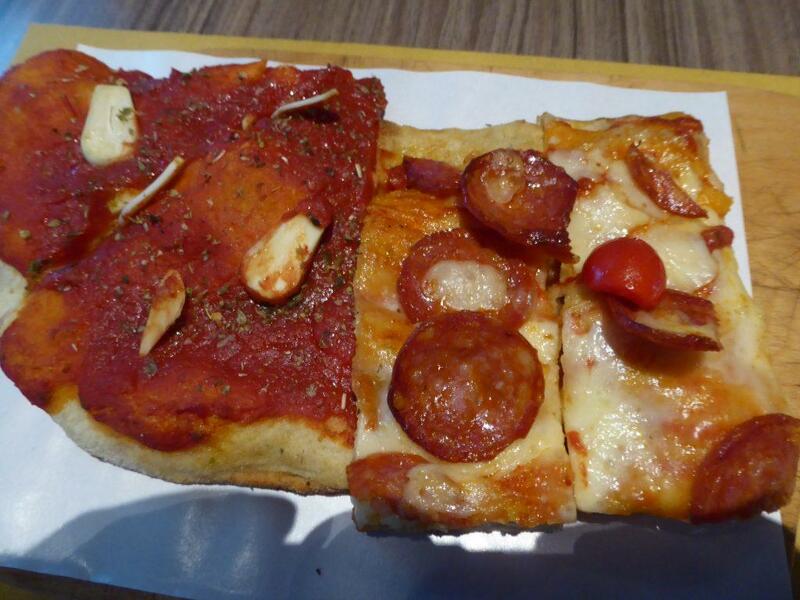 Pizzas come in medium size (160-300 baht) and regular size (375-415 baht). Extra toppings can be added if desired. The pizza menu is rounded out by a selection of antipasti, meat and cheese deli platters (450-750 baht), grilled meats (350-550 baht), salads, and a nice selection of sourdough bruschetta with various toppings. There are lots of vegetarian options. The bar menu features Italian craft beers on tap at 220 baht, as well as a large selection of bottles, cocktails at 240 baht, and mostly Italian wine by the glass and bottle with bottles from 1300 baht. 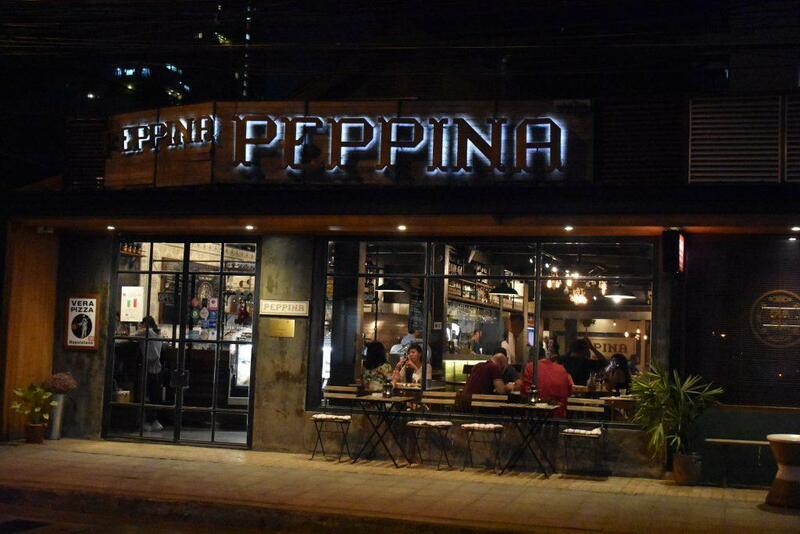 Peppina has three locations in the inner city at Sukhumvit 33, the Commons at Thonglor and at Central Embassy Mall. 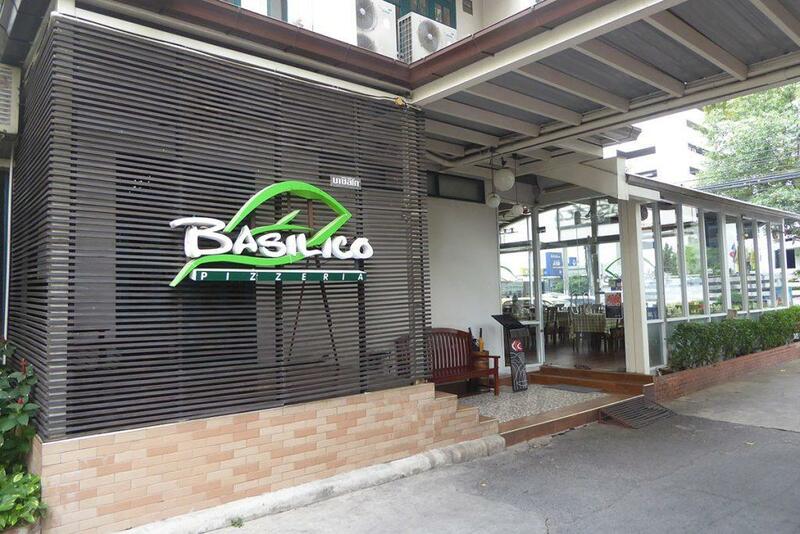 The Sukhumvit 33 branch is the original restaurant location and is very popular and busy. You will need to make a reservation for dinner here. The Commons branch is an upmarket food court style venue. Location: 27/1 Sukhumvit Road Soi 33, Bangkok. Also at the Commons & Central Embassy. Opening Hours: Lunch 11.30-15.00. Dinner 18.00-24.00. Getting There: BTS Phrom Phong (exit 5). Walk to the end of Soi 33 and turn left on to Phrom Chit, Peppina is on the right-hand side. About a 10-minute walk from BTS Phrom Phong. 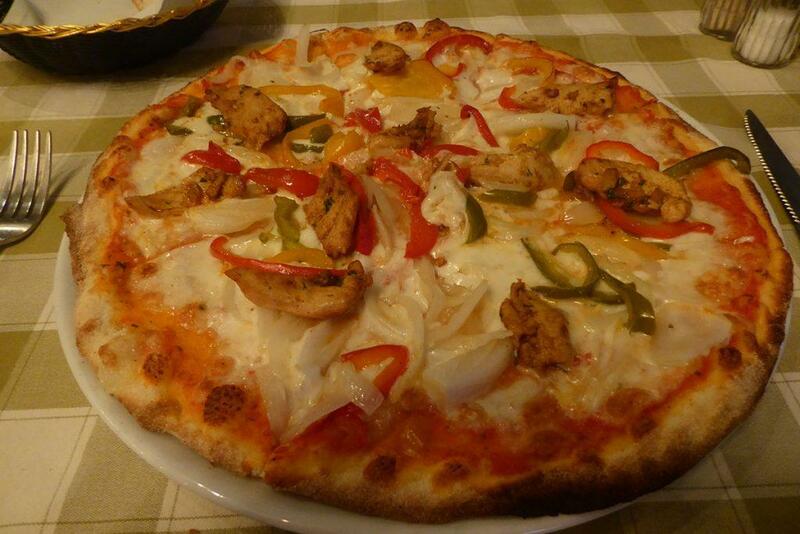 Pala Pizza Romana is an authentic bistro-style Italian restaurant and takeaway specializing in tasty Roman-style pizza. 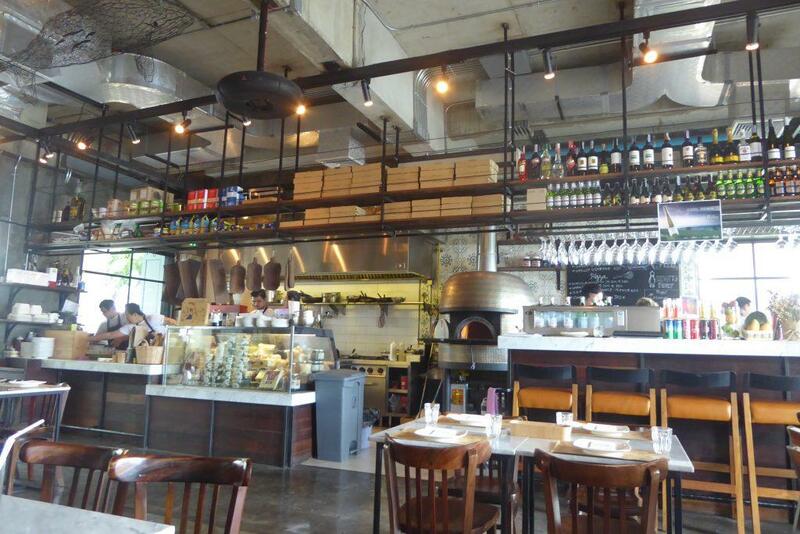 At first glance, you may think that Pala is one of those cheap pizzas by the slice places that you find in cities like London though actually, it’s one of the best pizza experiences in Bangkok. The pizza is stone baked in meter long slabs and sold by the slice or meter with a wide selection of toppings on either a takeaway or dine in basis. The pizza is soft and doughy on the base but with a crispy slightly charred crust. There is a small in-house dining area serving not only pizza but also pasta (including whole wheat), soup, fish, salads, and desserts, with many vegan and vegetarian options all at very reasonable prices. The menu helpfully labels which dishes are vegetarian, vegan or gluten-free. There is also a daily specials menu. The chef is Italian and most of the ingredients are imported from Italy. 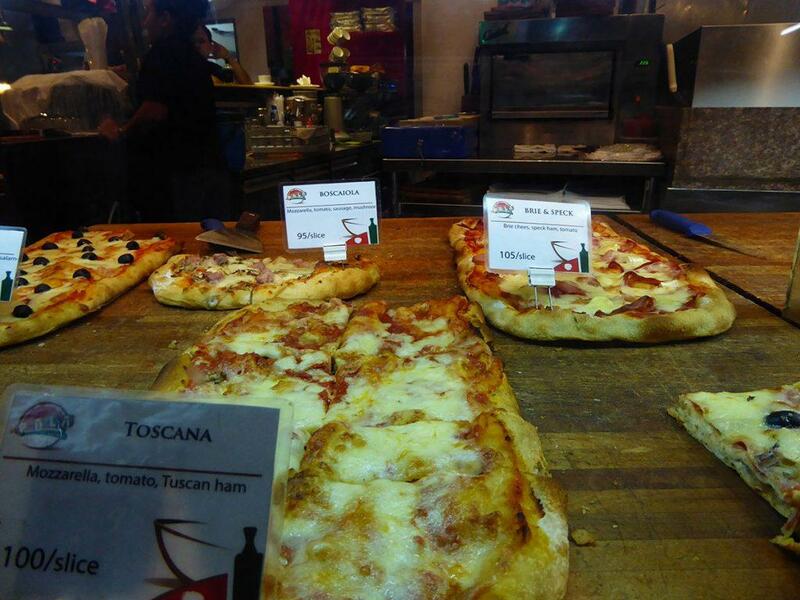 Prices are reasonable, pizza by the slice ranges from 45-105 baht or 360-840 baht for a half-meter. Main meat and fish courses 320-490 baht, and pasta 200-260 baht. There is a full bar menu with Italian craft beers from 180-600 baht, Italian Wine from 190-260 baht a glass, or 900-1750 baht for a bottle. 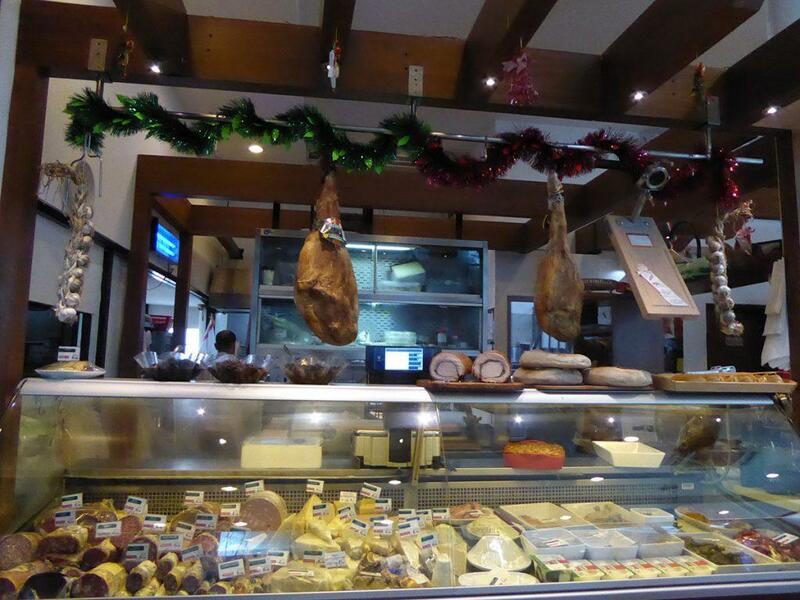 The restaurant also features a deli counter where you can buy cured meats, cheeses, canned goods, chocolates, sweets, cakes and bread which are either home-made or imported from Italy. Pala is always busy and is a great venue for either a quick snack or for a full sit down meal. Location: MRT Sukhumvit Exit 3. At the top of the escalator, street level. Getting There: BTS Asoke (exit 3), MRT Sukhumvit (exit 3). 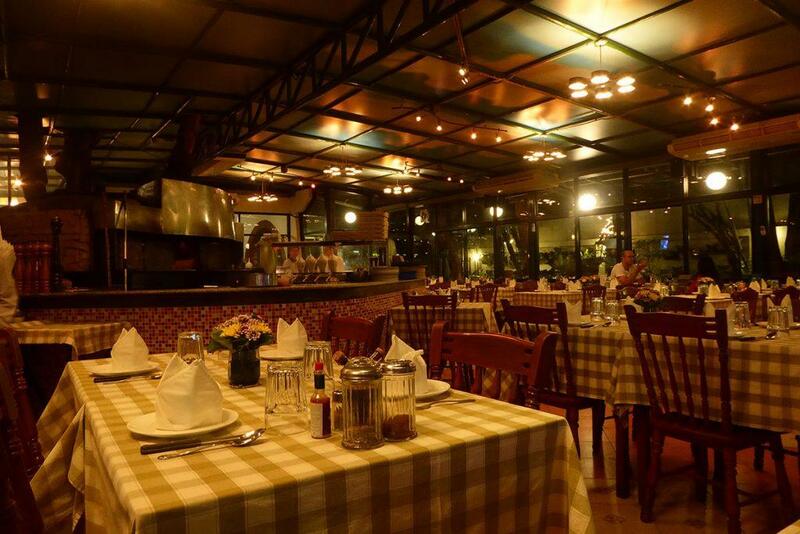 Basilico is a reliable Italian restaurant serving a full authentic tasting classic Italian menu at reasonable prices. There are 2 conveniently located branches on Sukhumvit Soi 20 and Soi 33. The Soi 33 branch is the original restaurant set in a big house with large windows looking on to the busy street and garden. The interior features a large open plan dining room with an open kitchen in the middle of the room complete with a pizza oven and cooking station. The décor is classic Italian trattoria with brick walls adorned with old prints and green and white chequered tablecloths. The menu consists of over 150 items and features a choice of over 50 pizzas from 200-450 baht which come in a thin crust with the option of ordering half n’ half toppings. 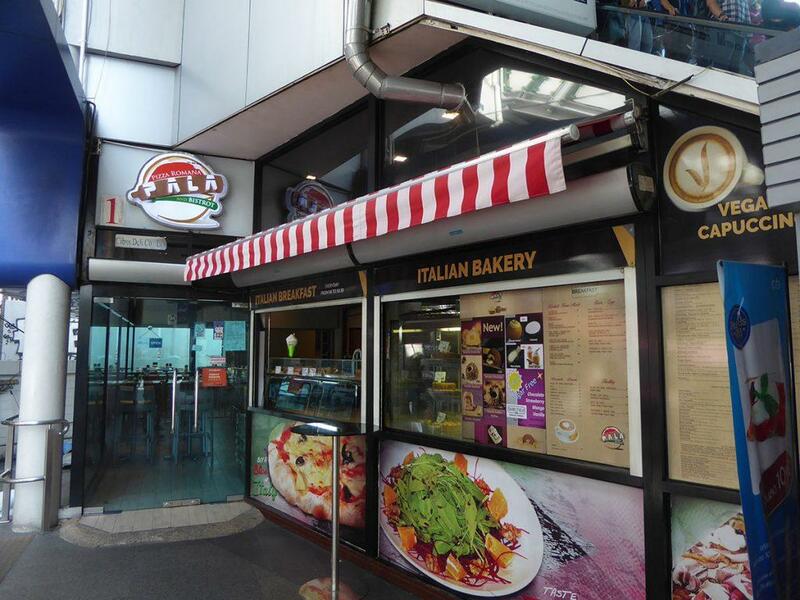 There is also a large selection of pasta from 250-500 baht. The meat and seafood main course menu includes steak, sausage, pork chop and chicken along with sole, sea bass, salmon, red snapper, trout, tuna steak, and king prawns prepared in a variety of styles at 300-900 baht. There is a full bar with Italian wines. Service is friendly and efficient. Location: 8 Sukhumvit Soi 33, Bangkok. Opening Hours: Lunch 11.00-14.30. Dinner 17.0-23.00. Daily. Getting There: BTS Phrom Phong (exit 5). Location: 15/1 Sukhumvit Soi 20, Bangkok. Opening Hours: Lunch 11.00-14.30. Dinner 17.00-23.00. Daily. The Chong Nonsi branch of New York ’s Dean and Deluca deli serve big tasty authentic slices of New York style pizza at 95 baht. There are usually at least three different flavor pizzas available. The Chong Nonsi branch also has a full range of meals, snacks, bakery, hot and cold beverages, and alcohol as well as a dry goods grocery section.